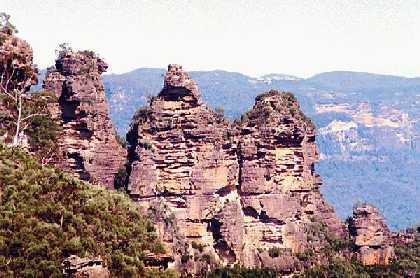 At Echo Point are the Three Sisters rock formation (pictured above)and the Giant Stairway that descends the cliff to the Jamison Valley floor far below. Numerous beautiful and spectacular walks follow along the lush green valley floor and the cliff edges ranging from short walk to treks days long. Every now and then a tourist on the long hikes goes missing over a cliff or gets lost in the vast Australian wilderness. The Blue Mountains can be hot in summer so take adequate water for long walks in the isolated valley. In winter the Blue Mountains are cold and it can snow. There is an information office at Echo Point that sells walking maps. For the less energetic there is a very steep and exhilirating Scenic Railway J J (pictured)down the cliffside from near Katoomba. It runs at a 45 degree decline. Cost $4 one way. Phone 47822699. The railway operator also runs the Scenic Skyway JJ which crosses the valley to the cliff edge on the other side. Cost $4 return. Metropolitan trains from Sydney’s Central Station run to Katoomba and other towns in the Blue Mountains along the Great Western Highway. The trains to Katoomba leave about once an hour and the journey takes 2 hours. Trains are less frequent west of Katoomba. Infrequent buses run along the Great Western Highway. The buses do not run on Sunday. Various operators offer rockclimbing, abseiling, canyoning and caving half and full day excursions. Australian School of Mountaineering 166B Katoomba St. Phone 47822014. Introductory rockclimbing $95, abseiling $69, canyoning $95. Blue Mountains Adventure Company 84A Main Street. Phone 47821271. Enquire for prices. High ‘n Wild Corner Katoomba and Main Streets. Phone 47826224. Highest introductory abseiling $49. The YHA hostel and Cycletech at 3 Gand St hire bikes for $20 a day. Mountain Designs at 190 Katoomba St has better bikes for $15 a half day. Also available are half and full day mountain bike tours from $48. YHA Katoomba Corner Lurline and Waratah Streets. Phone 47821416. Dorm $12, double $25. Katoomba Mountain Lodge 31 Lurline St. Phone 47823933. Dorm $11, single $28, double $42. Blue Mountains Backpackers 190 Bathurst Road. Phone 47824226. Dorm $15, double/twin $40. All three hostels are friendly and cosy. Katoomba Hotel is the local pub. Corner of Parke and Main Streets. Phone 47821106. Dorm $12, single $20 ($25 on weekends), double $45 ($50 on weekends). Nomads Gearin’s Hotel is a local pub. Phone 47824395. 273 Great western Highway behind the railway station. Dorm $15, single $25, double $50. Clarendon Guesthouse Corner Lurline and Waratah Streets. Phone 47821322. Single $38 ($68 weekends), double $48 ($88 weekends). Cosy atmosphere, log fire, games room, cocktail bar. Three Sisters Motel 348 Katoomba Street south of town towards Echo Point. Rooms $50/455 rising to $95 on weekends. 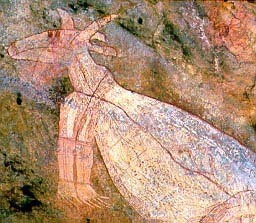 Limestone caves. One hour ($12) and two hour ($20) guided tours of the caves run from 9.30am to 5pm. Phone 63593311. No independent viewing. Parking $2. Facilities include restaurants, cafe and expensive guesthouse only. This road across the Blue Mountains from Sydney is more scenic and much more isolated than the Great Western Highway. Zig Zag Railway J (pictured) built in 1869 was the first rail descending the west side of the Blue Mountains to Australia’s vast interior. The restored train takes tourists down a precarious route where the train must back up three times to descend. Cost $12. Phone 63514826 for timetable. 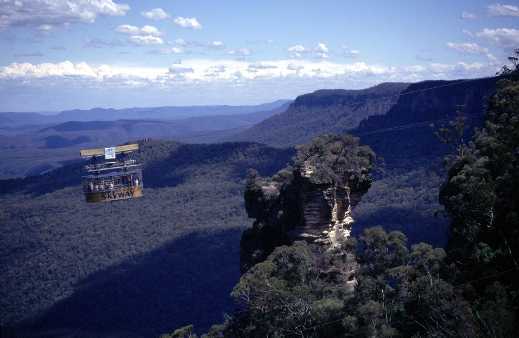 Go to Sydney, 110 km east of Katoomba. Travel 1500km west to Adelaide across vast plains and desert via Dubbo, the isolated mining town of Broken Hill and the dry Flinders Ranges.